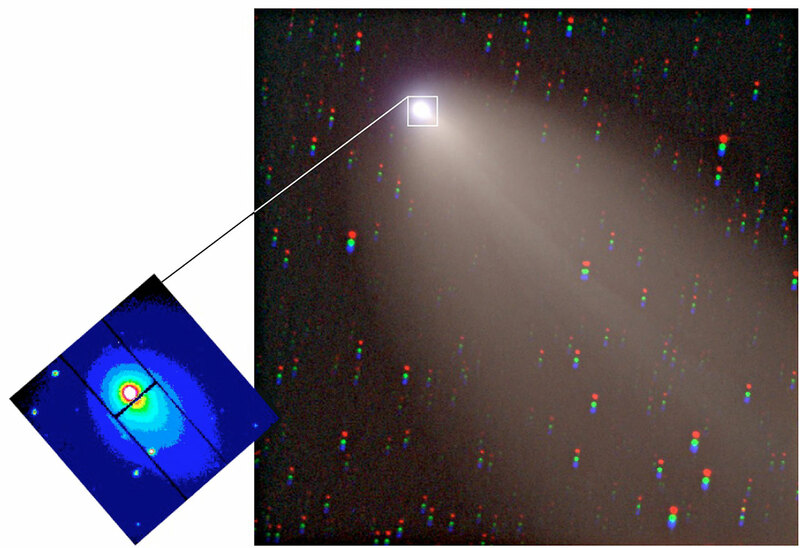 Image of Comet LINEAR (C/2000 WM1) with the UVES slit viewer image. The colour composite in the large frame (sky field: 16 x 16 square arcmin) was obtained by Gordon Garradd (Loomberah, NSW, Australia, loomberah@ozemail.com.au). The UVES slit viewer photo (small frame; 40 x 40 square arcsec) is a false-colour image taken in the (red) R-band with UVES+KUEYEN on March 22, 2002; it shows the position of the narrow spectrograph slit (0.45 arcsec wide and 8 arcsec long) crossing the inner coma and through which the comet's light was captured to produce high-resolution spectra. The slit has been offset from the center of light to reduce contamination from solar light reflected off dust particles in the comet's coma - there is most dust near the nucleus. Notes: The left image was taken using the VLT, the right is a photograph captured by Gordon Garradd.